3x3 Basketball is one of the most popular sports in KCM. This year there were 4 boys team & 2 girls team. Sports Club successfully completed the event by conducting all the games on time and with full responsibility. 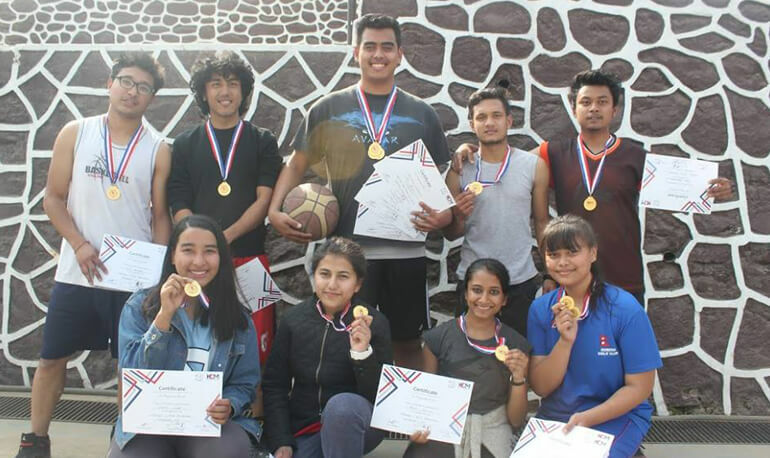 The Winners were: "Anul & Co.” from the Boys team: Anul Suwal Abhik Kansakar Poozan Manandar Ronak Agrawal Ajid Shrestha Srijan Puri & “Phalano Girls” from the Girls team: Astha Subedi Sirjana Paija Kritisha Prajapati Alka Giri Sneha Agrawal The champions won their respective matches by 14 points and 63 points where Sirjana Paija was the top scorer for Phalano Group and the top scorer for Anul & co. was Anul Suwal with a staggering 51 points to his name. The player of the match were Anul Suwal & Jana Paija with top scores.